grey barn grey day, originally uploaded by jahansell. We've had beautiful weather for the last few weeks - it's only rained at night. 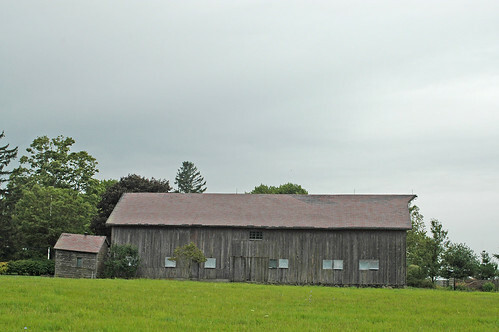 But today it's dark and gloomy - this barn up on Jackson Hill Road looked gray and silent. These rustic old barns are a lot better than the new metal contraptions. Very down home. Barns--we could do an entire photo album of old barns as a subject. Wouldn't it be great if the weather always did that...fine during the day and rain at night. A tranquil photo. What a nice shot of a big barn. Having been raised on a farm, I have a love for the old weathered barns. This is a wonderful photo!